The Surrey Eagles advanced to their fourth Fred Page Cup Final on Tuesday night after a 5-2 victory over the Alberni Valley Bulldogs in Game 4 of the Coastal Conference Final. Michael Stenerson had a hat-trick to lift the Birds to a four-game sweep. The Eagles sustained some early pressure from the Bulldogs in the first and bounced back with a number of good chances of their own. Heading into Game 4, neither team had scored a first period goal in the series, but the Birds broke that trend when Brady Shaw wired a wrist shot over Jay Deo's left shoulder off the rush with just 17 seconds remaining in the period, putting Surrey ahead with his sixth goal of the playoffs. Surrey extended the lead early in the second when Stenerson potted his first of the game, beating Deo with a backhander that snuck through the five-hole. The Birds pulled away in the latter half of the stanza, scoring two goals in less than a minute. Stenerson scored off the rebound of a Demico Hannoun shot on the power play before Craig Wyszomirski blew a slap shot past Deo from the top of the left circle ti give Surrey a 4-0 lead after two. Alberni Valley didn't quit in the third, and the Dogs rallied. Ryan Buse found the back of the net with a wrist shot from the point to put the home team on the board, and Manny Gialedakis pulled the Bulldogs to within two when he shovelled a rebound into the goal. But the Alberni comeback ended there. The Eagles kept them off the board the rest of the way, and Stenerson completed the hat-trick with an empty netter in the final minute. Surrey went 1-for-3 on the power play while the Bulldogs were 0-for-3. Alberni Valley out shot the Eagles in the game 38-37. The win vaulted the Eagles into their first Fred Page Cup Final since 2005 and their fourth final series since the team arrived in Surrey in 1991. 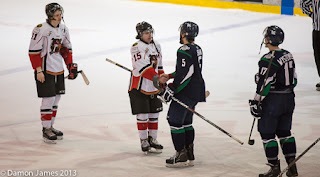 Game 1 goes on Friday, April 12th at the South Surrey Arena against either the West Kelowna Warriors or Penticton Vees. Tickets go on sale at noon on Wednesday, April 3rd. Call the Eagles office to get yours seats at 604-531-GOAL (4625).